How often have you heard someone ask “where did the time go?” It’s easy to ignore or simply not notice the passage of time, particularly when you’re occupied with some other pursuit. 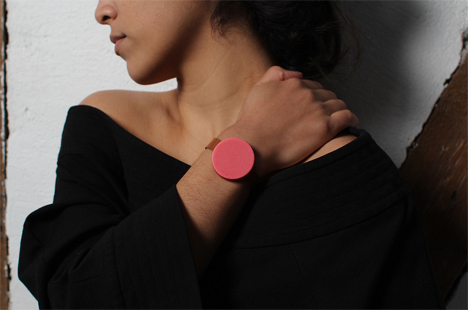 Design duo Skrekkøgle have come up with a simple way to keep you aware of how many minutes are slipping away. The object is called Durr; it is a vibrating bracelet that vibrates every five minutes as a reminder to be present, in the moment, and aware of how you are using your time. It could be a potent reminder to cherish each moment because in the big ol’ picture of life, the universe, and everything, we don’t really have too many minutes to spend on Earth. Skrekkøgle used a Makerbot for the bracelet’s outer parts (except the leather band) and an Arduino inside to trigger the vibrations. The design is still being developed and refined, but the team have already produced (and sold) 50 prototypes. The project was initially begun just to see if there was any consumer interest in a product like Durr. Now that the interest has been proven, it isn’t clear whether the company will make and release any more time-perception bracelets.